I grew up by the shores of Lake Michigan. We used to play a game in the summer time. At the beach we would try to smash through the waves that crashed upon the shore. For some reason I really enjoyed the body-shaking feeling of a wave reverberating through my bones. As I think back on it now, I was communing with the superhuman force of ocean currents. Much later in my life I was exposed to the more gruesome power of such waves. I was part of a team conducting an ethnography of a series of coastal villages in Northwestern Papua New Guinea that were wiped away by a tsunami. We were trying to understand how people in the community dealt with the trauma of that event. In the tip of the wave, as if enclosed in some kind of transparent capsule, floated K’s body, reclining on its side. But that is not all. K was looking straight at me, smiling. There, right in front of me, close enough so that I could have reached out and touched him, was my friend, my friend K who, only moments before, had been swallowed by the wave. And he was smiling at me. Not with an ordinary smile—it was a big, wide-open grin that literally stretched from ear to ear. His cold, frozen eyes were locked on mine. He was no longer the K I knew. And his right arm was stretched out in my direction, as if he were trying to grab my hand and pull me into that other world where he was now. A little closer, and his hand would have caught mine. But, having missed, K then smiled at me one more time, his grin wider than ever. I don’t know what spirituality is, but when I think of the word, I think of waves—thought waves. Because I am interested in the materiality of thought and its medium, I often ask myself: what is thought made of? What is its material? Perhaps thought is like a sound wave. Certainly one medium of thought is sound waves. Thought travels in sound waves. Sound waves are waves of pressure. Like most waves in nature, sound waves must propagate in a medium, for example air or water (sound traveling in such media has different properties depending on the medium). Perhaps thoughts, like sound, need to travel in a medium. Or maybe they work differently, like light, and do not need a medium at all. Perhaps thought has this dual nature too. 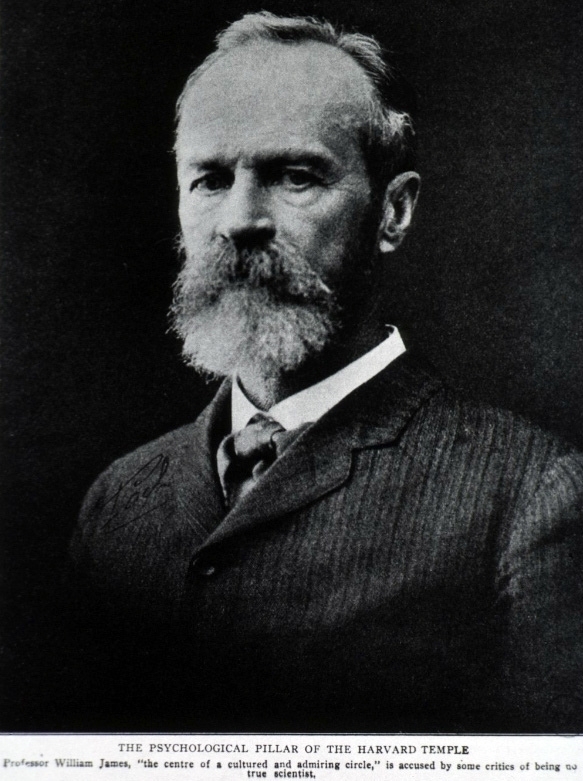 As William James said: “our brains are colored lenses in the wall of nature, admitting light from the super-solar source.” James was giving a lecture at Harvard on the subject of human immortality. When James spoke of spirituality or the spiritual he meant consciousness. James was trying to deal with the problem of consciousness, the so-called “hard problem” about how the brain relates to consciousness. We are not that much further along now than we were 100 years ago when James gave his speech. James thought sense could be made of the idea of immortality, that some version of consciousness could be thought to survive death. Or at least he thought that brain death was not necessarily the complete death of consciousness. Perhaps there was some general form of consciousness, one consciousness, that beamed like light. James speculated that brains were lenses that changed the nature of that light and created individual consciousness. Brains, then, did not cause thoughts or consciousness (in what he called a productive function); instead brains had a transmissive function, akin to how vocal chords constrain air to produce a voice but do not themselves produce the voice. In contrast, those who thought the brain had a transmissive function saw the brain as an apparatus for letting consciousness loose upon the world. James looked to Shelley’s Adonaïs: An Elegy on the Death of John Keats, Author of Endymion, Hyperion, etc in order to make his point: “Life, like a dome of many-colored glass,/Stains the white radiance of eternity” (stanza 52). The brain, according to James, was a threshold like this many-colored glass. I live in Europe where the frequency in which power utilities transmit electricity, that is, waves of electrons, or electric charge, is 50 Hz. In most places, in other words, a wave of electrons cycles 50 times per second. If an ocean wave hit the shore 6 times every minute, its frequency would be .1 times per second, or .1 Hz. A heart with a pulse of 60 beats per minute is 1 Hz. The US transmits electricity at 60 Hz. The waves hit 10 times more times per second than in Europe. In either case, the pulses are coming too fast to perceive consciously. But, if you record your TV with a video camera, in most cases you will observe a pulsating, flicker effect due to the difference between the frequencies of the recording device and the 50 or 60 Hz. pulse of the television. I had a student last year who was allergic to “electricity, electromagnetic radiation, and wireless internet.” She lives in a home completely free of electricity, except for an old computer she uses for limited periods each week. I never saw her; we communicated exclusively by email. James would have appreciated the situation of my former student. Her example suggests not only that thoughts are embodied, but that thoughts are physical things—or at least, that they exist at a physical level. This example also suggests how human thought is closely bound to technology, that it is connected to our electrified universe. In the case of my former student, the most likely culprit is the technologically produced electrical energy interfering with the electrical and chemical pathways that regulate homeostasis in her brain and body, in her psyche and soma. Some of this may sound strange, until one considers that waves themselves also carry energy. 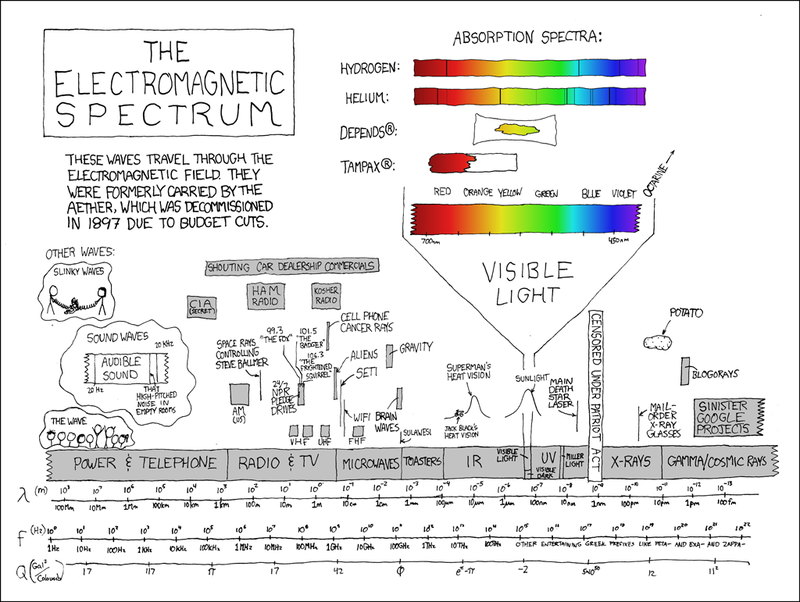 Photons, for example, are the fundamental unit of light; they propagate with different frequencies that are characteristic of different forms of electromagnetic radiation or energy. Unlike light, utility power is transmitted by moving an electrical charge; that is, a wave of electrically charged particles. Such a wave generates a magnetic field. Neuroscience is a young field, just at the beginning. The physics, nuts, and bolts mechanical processes of the brain are pretty well understood. Signals within the body and brain are composed of chemical variations and electrical changes. Though there are many types of communication within the brain, a most basic one is composed of neurons. Neurons create electrical potentials that “fire” and propagate throughout the brain. The patterns of firing in the brain can also be described as “waves”. Unlike the electric wave that is transmitted on a power line, the medium of transmission of brain waves are cells, biological material. However, as in the case of my former student, it is possible that such biological material can be destabilized by electromagnetic energy from other sources. 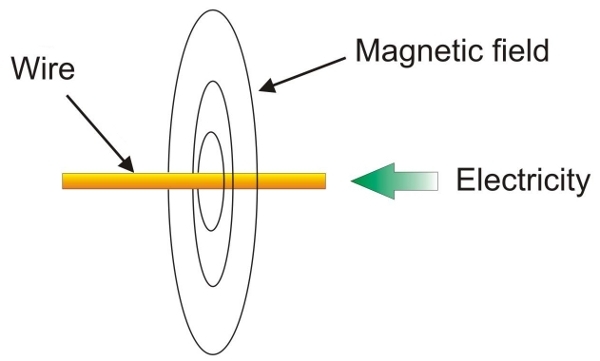 We know a bit more about what is going on inside brains today than we did in James’s day because we have more reliable ways of locating and measuring the electric waves and magnetic fields noted above, the core media of the brain’s activity. For example, the best and most recent brain scanning equipment, functional magnetic resonance imaging (fMRI), measures the magnetic properties of oxygen molecules in the brain. It works because hemoglobin, the most important blood protein, changes its magnetic properties depending on how much oxygen it contains. The body delivers oxygen molecules to parts of the brain that need to do more work. So fMRI does not actually measure brain activity directly but rather blood flow in the brain (changes in oxygenation). Instead of oxygen flow, another type of brain scan called Electroencephalography (EEG), measures electricity generated by the brain. While fMRI is good at scale (spatial dimension) it is not as good as EEG at time (temporal dimension); that is, fMRI technology is too slow to capture neural processes (because it measures them indirectly by blood flow). 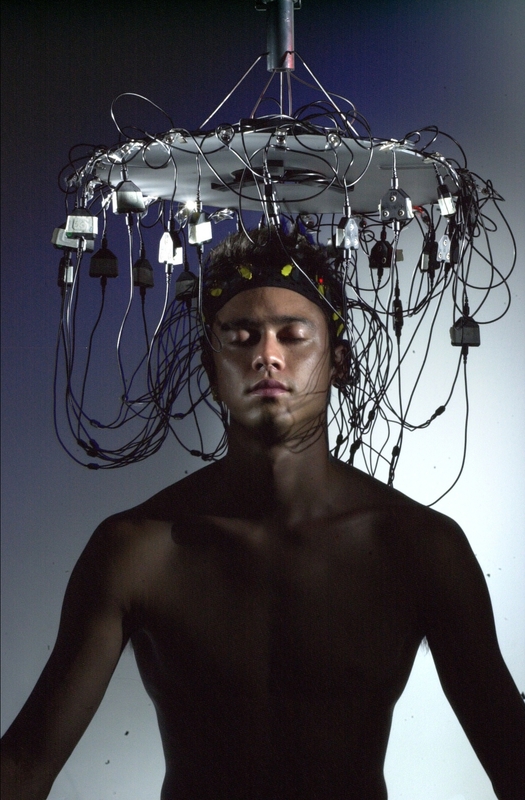 EEG, by contrast, captures electrical signals in real time. However, EEG is limited because it only captures electrical energy at the scalp—it does not reach deep into the brain. 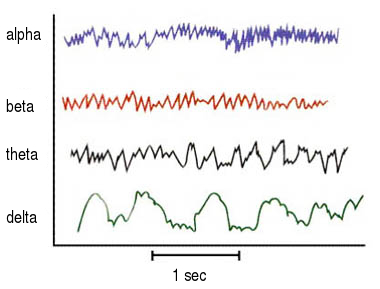 So EEG captures the wave pattern of firing neurons. In popular understanding these are called brain waves, but scientists call them neural oscillations. The terminology is probably reflective of the fact that brain waves are associated with the unverified notion that such waves travel outside the brain (that is, between brains). By contrast neural oscillations only apply within brains. The patterns researchers have found in humans are usually localized (meaning they take place at characteristic places in the brain) and tend to take place during certain types of activities. For example, delta waves are characteristic for adults in slow wave or non-REM sleep and in some attention tasks; theta waves are characteristic of encoding and retrieval in memory and inhibition; alpha waves are associated with focusing of attention. A rhythmic firing pattern of up to 4 Hz. (4 cycles per second) is a delta wave, then there are theta (4-8), alpha (8-13), mu (8-13), beta (13-30), and gamma (30-100) frequencies. Recent theories suggest that the “neural correlates” of various conscious states are not particular neurons but rather these patterns or waves firing in synchrony. The excitement over the recent discovery of mirror neurons—a type of neuron that fires both when an action is observed and when an individual performs the same action—is that they suggest such synchrony of firing is not confined to individual heads. Brain waves might not move between brains but people may still share patterns of neural activity. Such an idea was probably first proposed by Gerald Edelman who argued that the “dynamic core” of consciousness is synchronous firing occurring globally across many brain areas. Local waves become part of consciousness when integrated into that global synchrony. Gamma waves in particular have been a focus of attention in this regard. So like James, Edleman’s is a holistic conception of consciousness, but grounded in neuroscience. One’s perspective on consciousness, of course, is a politico-historical subject. To be sure, James’s view is thoroughly modern. However, counter to a neo-liberal view of consciousness, James’s “downward” view suggests that the purpose of thought is not necessarily to help human beings transact or trade. Thought does not exist simply to help singular human beings get the best deal out of things. Indeed, James’s version figures brains as getting in the way of consciousness. Catastrophic waves, electromagnetic allergies, and brain scans are part and parcel of the present moment when we are recognizing the dual nature of thought: its physical and “spiritual” nature. Our conception of consciousness should follow something like James’s model. A conscious self is physical, and yet not necessarily some kind of automated machine. Like my former student, such selves are deeply affected and implicated in the material world, identical to it, yet paradoxically outside it.